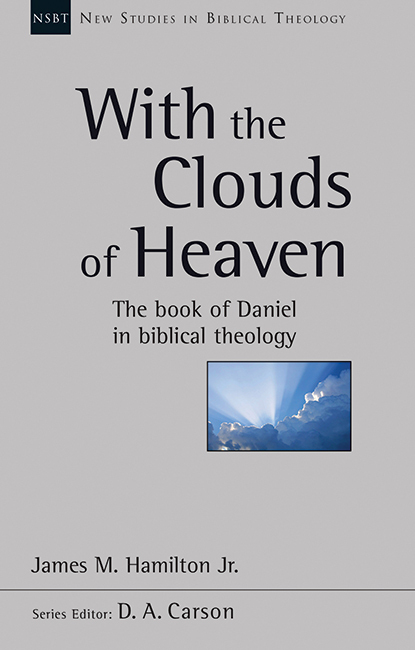 Much ink has been spilled (or keys tapped) over the book of Daniel, but Jim Hamilton perceived a glaring omission: “an evangelical and canonical biblical theology of Daniel” (p21), which is what With the Clouds of Heaven provides. To unpack his quote, evangelical means accepting “evangelical conclusions on questions of date and authorship” (p31); canonical means reading Daniel while considering its placement in the Biblical canon, particularly the Hebrew OT order; and biblical theology means noticing how “Daniel has engaged earlier Scripture to present his message and how later Scripture engaged Daniel to exposit what he wrote” (p27). With the Clouds of Heaven is less a commentary of Daniel as it’s an attempt to understand its role in the larger Biblical storyline. We’ll start with a brief summary of the chapters in With the Clouds of Heaven and then get our hands dirty with some of the details. Chapter 1 explains Hamilton’s intention for the book and delivers an impassioned and quotable defense for the historicity of Daniel. If Daniel’s stories are fictional, then “there is no proof that [Yahweh] is any better than the false gods who can neither reveal the future nor deliver their worshippers” (p32). Ouch! Chapter 2 is focused on tracing the OT story from creation to Israel’s exile and recognizing how Daniel picks up on these themes and runs with them, particularly Moses’ prediction of Israel’s exile in Leviticus and Deuteronomy by way of Jeremiah. Hamilton wisely spends Chapter 3 surveying the literary forest of Daniel before the exegetical trees. He does this by identifying the smaller units (nicely matching up with our modern chapter divisions), the units’ relationship with each other, and then the macro-structure of the book, which Hamilton argues is chiastic (see my post). Chapter 4 tackles the visions of Daniel 2, 7, 8, 10-12, and Chapter 5 is devoted to Daniel 9. Chapter 4 and 5 are far too dense to summarize here, but Hamilton takes a broadly futurist view with the visions extending until Jesus’ second coming establishing the millennial kingdom of God. Even if one does not agree with Hamilton’s conclusions here, these chapters are rich with details. Chapter 6 inspects the heavenly beings and asks whether Daniel intended any to refer to the Messiah (e.g. the fourth man in the fiery furnace)? Hamilton’s conclusion is in the negative, aside from the Son of Man in Daniel 7 who is Messianic, human, and much more. Chapters 7-9 sketch out how Daniel is interpreted in other writings: intertestamental literature (Chapter 7) and the New Testament (Chapter 8), with John’s Apocalypse receiving its own chapter (Chapter 9). Chapter 10 argues that Daniel contributes to Biblical typological patterns (e.g. details in Daniel’s story appear much like Joseph’s) and that they are all culminated in Jesus. I must emphasize that not only is Daniel a complicated book, but With the Clouds of Heaven is wonderfully rich with details and compelling suggestions. I cannot hope to comment on everything, but will attempt to highlight some perceived strengths, weaknesses and potential issues. I appreciated that Hamilton is unafraid of employing passionate rhetoric to defend the pastoral concerns with late-dating Daniel. He recognizes that God’s own trustworthiness is at stake. In fact, Daniel’s entire exhortation to perseverance collapses if these are merely stories. How can we trust his encouragement if God did not in fact protect His people! Possibly the greatest strength in With the Clouds of Heaven is that it achieves what it sets out to do as a work of Biblical theology by placing the Daniel tree in the Biblical forest, being sensitive to symbolism, and by being rich with intertextuality. The treatment of the number-symbolism throughout Daniel was particularly insightful. Hamilton deftly pulls together divergent threads throughout the OT into a compelling whole. Seeing how Daniel constantly alludes to earlier OT material was also rewarding. The chapters on NT allusions and quotations were excellent and, aside from chapter 2, the high-point of the book for me. Hamilton showed a number of allusions I’d never noticed before and helped clarify some things. It was such fruitful chapters that I only wish more space had been given for listing more allusions, and for teasing out exactly how the NT is using these references. Also, at least one notable passage was missed. Jesus’ ascension to the Father in the clouds (Acts 1:9) calls to mind Daniel 7’s son of man who receives dominion, not in coming to earth, but in coming to the Ancient of Days in the clouds (Dan 7:13-14). I was disappointed that Hamilton lacks any discussion of this text, since an allusion would make a futurist reading of Daniel 7 much more difficult. Even if Hamilton disagrees with it being an allusion, I would like to know why. Also noteworthy was Hamilton’s unique approach to Daniel 9; hovering over this difficult text and swooping down at it three times, getting closer with each pass. The first pass appreciates the structure and time markers of the seventy weeks, the second compares it to the other visions in Daniel and allusions to other Scriptures, and the third attempts to fill in the remaining details. This is a superb example for how to tackle difficult texts, even if one disagrees with Hamilton’s conclusions. The Jews causing the temple’s destruction is incongruous with the visions of 2, 7, 8, and 10-12 where Israel’s opponents do this. The Messiah cannot be the one making the covenant in Dan 9:27 as he has just been killed in Dan 9:26. It relies of Josephus’ account of AD70, which implies that “apart from Josephus we would not know about the fulfillment” (p121). Daniel 9 is in fact different from the other visions. It is focused less on the nations persecuting Israel and more on Israel itself, their faithlessness to the covenant, the solution for their sin and exile problem, and their Messiah’s death. Trying to match it closely with the other visions may in fact be forcing a square into a round hole. Hamilton misrepresents Gentry’s view, which sees v26 and v27 as having an A-B-A-B pattern, so that the Messiah’s death brings the covenant. There is no inconsistency here. We are unafraid of using secular historical data to clarify Daniel 8 and 11, so why not Daniel 9 too? Again, a thorough engagement with opposing views is outside the scope of this book, but I was disappointed here. Although I previously posted his chiastic structure for Daniel, I must admit to being skeptical of it. First, it doesn’t seem to add much to the already-agreed upon chiastic structure of ch2-7. Second, joining ch7-9, as being parallel with ch2 makes sense, but excluding ch10-12 seems arbitrary. Lastly, constructing such an all-encompassing but tentative chiasm either results in necessarily tentative implications or a self-admitted futility of the whole enterprise. It is fortunate that Hamilton did not rest much of his conclusions on this chiasm. It is assumed that references to “the end” or “latter days” (e.g. Dan 2:28) speak of the time surrounding the second coming of Jesus despite that (at least three of) the kingdoms mentioned are in our past and that God will establish His kingdom “in the days of those kings” (Dan 2:44). Apparent discrepancies are resolved more often through typology than attempted harmonization. For example, the numerous parallels between Greece and the fourth kingdom are “proof” of a typological connection between them, rather than proof that they are in fact the same kingdom. The 11th horn from the fourth kingdom (Dan 7) is assumed to be a future antichrist figure; there is no discussion of potential fulfillment in the Roman persecution of Israel during the war culminating in the AD 70 destruction (p104). Considering that it’s another example of the pattern set in Daniel, it’s strange that AD 70 receives very little attention. Of course, doing so would challenge his futurist reading. The abomination of desolation in the Olivet Discourse is considered to be a person (Mark 13:14); the same person as in 2 Thess 2:1-12. The parallel passage in Luke 21:20, which may point out that Jesus was thinking of AD 70, not our future, is not discussed. To conclude, I’ll employ Hamilton’s three-swoop approach. A book should be broadly judged on the basis of what it is intended to be, not what the reader wants it to be. As a biblical-theological reading of Daniel, With the Clouds of Heaven certainly succeeds. It is rich with stimulating and compelling details and arguments. Swooping in closer, I perceived, and have noted above, some issues with his conclusions. And lastly, on a more subjective level, one’s own view of Daniel and eschatology will determine their agreement and possibly enjoyment. Hamilton adopts a Historical Premillennialist viewpoint, so readers from other systems will find more to disagree with and may get significantly less from the book. Other interpretative options are not given much space, so With the Clouds of Heaven would be disappointing if that were expected of it. Hamilton’s intention is to contribute something fresh and less to comment on the commentators. However, I do wish he had argued for his futurist views with a self-conscious intention to convince the doubters, keeping an eye over his shoulder for potential disputants. So with that said, I can certainly recommend With the Clouds of Heaven as an introduction to Daniel, its literary features, and its place within the canon. This would serve as an excellent textbook for a Daniel class, but any reader would benefit from looking at Daniel through such a wide-angle lens. Hamilton offers a fresh evangelical contribution to the vast literature on Daniel. It’s unavoidable in a book on Daniel that the author’s idiosyncrasies will reveal themselves, but being exposed to differing views and rethinking one’s own can be a very healthy and sharpening experience! Many thanks to IVP UK for providing a review copy of this book. I was not required to provide a positive review; all thoughts are my own.